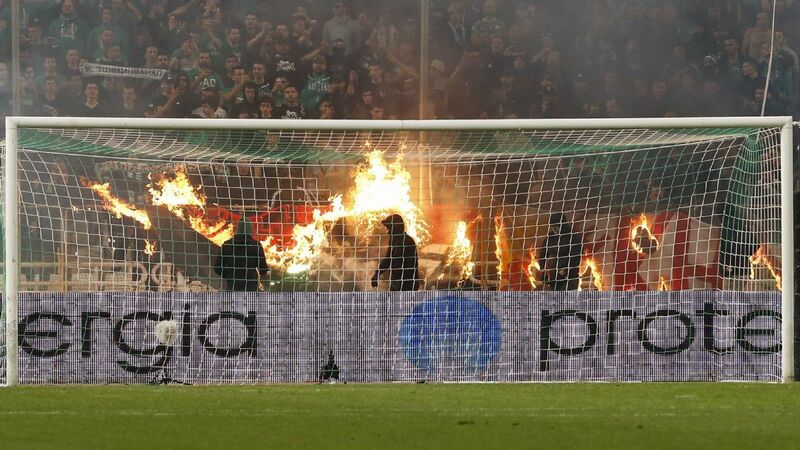 Panathinaikos fans set fire to a banner during a clash against Olympiakos, which was abandoned. Panathinaikos' match at home to Olympiakos was abandoned on Sunday after their fans attacked players on the visiting team's bench during the Greek Super League match and clashed with police outside the OAKA Stadium. About four minutes after kick-off in the Athens derby, Panathinaikos fans invaded the area surrounding the pitch and attacked Olympiakos players on the team's bench. The match was stopped for about eight minutes before resuming. Greek side Panathinaikos have confirmed the signing of former Manchester United forward Federico Macheda on a three-year deal. Macheda, 27, burst onto the scene with a last-gasp winner on his United debut against Aston Villa in the 2008-09 campaign, which would help the club go level with Liverpool on 18 Premier League titles. However, at the age of 17, that proved to be the highlight as his career took a downward spiral. Greece's oldest football club Panathinaikos have been banned from European competition for three seasons for failing to pay their debts, UEFA has announced. The Athens-based club were given a suspended sentence by UEFA's Club Financial Control Body, the panel that oversees the governing body's financial fair play rules, in December and told they had until March 1 to settle their unpaid bills. ATHENS, Greece -- Panathinaikos say long-delayed payments have been made to Michael Essien and two others in an effort to avoid losing nine points as the Greek club struggles with mounting debts and the threat of relegation. A sports judge ordered Panathinaikos to settle debts with Essien, Argentine winger Sebastian Leto and Spanish forward Toche within three days or lose the points. Club officials did not say how much money had been paid. Panathinaikos has not reached a settlement over unpaid wages with former defender Jens Wemmer. The Greek Super League has deducted three points from Panathinaikos after the club failed to settle unpaid wages with former player Jens Wemmer. The league said the points will be returned if the debt is settled. The decision dropped Panathinaikos two places to 11th in the league with 29 points from 26 games.